If there is a wheel, there is a way! 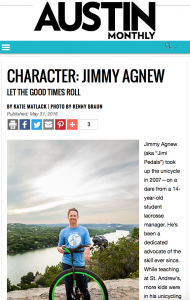 For the past 14 years, Jimmy Agnew has kept Austin weird in his own unique and authentic way. The native Texan and self proclaimed “Play Enthusiast” has a B.S in Exercise Science from Texas Lutheran and a M.Ed in Childhood Development from Texas State University. While extremely new to non-profit world, the former collegiate athlete and adventure traveler has a very unique and diverse athletic background. He has traveled the world as a former marathoner, avid minimalist camper, and outdoor adventure enthusiast. He has had the privilege to coach Jr. Olympic basketball teams through international competition and has logged over 20,000 miles of self supported cycling across the United States on both a bicycle and a unicycle. 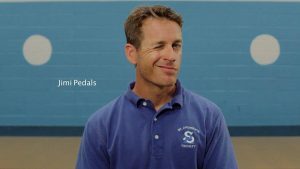 In his 13 years as an elementary school teacher and varsity coach at St. Andrew’s Episcopal School, he was able to start one of the largest school based unicycle clubs in the nation. Over the past 8 years, their school club, The Uni-Saders, have inspired over 700 children of all ages to grow physically, mentally, emotionally, and socially through one-wheeled play. In the spring of 2015, one of their school documentaries was accepted into the SXSW Edu film festival in Austin, TX and Jimmy’s path was forever changed. Realizing the potential and appeal of the uniquely inclusive program, Jimmy rode the SXSW momentum and launched a non profit organization called One Wheel Many Children. OWMC is designed and focused on empowering communities through the creation of sustainable child centered unicycle clubs. Currently their organization is running multiple school pilot projects in underserved communities. 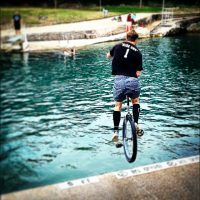 As an educator and coach, Jimmy’s goal is to incorporate unicycling and literacy into physical education and literacy curriculums into schools across the nation. In November of 2015 he discovered Modo Yoga and quickly began to develop a very strong and balanced practice. As Jimmy puts it, “Diving onto the mat and fully committing to a consistent yoga practice has been very similar to learning to ride a unicycle. They both take an honest effort towards lasting personal growth, a genuine sense of self awareness, and a realistic understanding of perceived limitations.” This realization has lead him to his most recent innovative venture that playfully blends two of his biggest passions, unicycling and yoga. The idea of empowering children and adults to develop a more balanced life through “ModoCycling” has recently received national attention from Time Warner’s Active Now campaign. He’s not sure where this ModoCycling path will lead him, but he’s excited to pedal the idea to Kelowna, B.C this summer where he plans to begin his intensive 500 hour international Modo Yoga training course. Throughout these significantly rich and diverse life changing experiences, Jimmy has come to believe in the importance of building healthy play based communities and the power behind living a simple and purpose filled life. My life’s uniquely diverse path has led me to a great realization, and today I find myself at the crossroads of a tremendously empowering opportunity. This realization has led me to leave the classroom and focus my efforts on creating a unified movement that connects and empowers children as they learn to unicycle. This child centered movement is driven by play based service learning. It is powered by the whimsical joys and unique curiosities that children naturally exude. It is fueled by human nature and the need to find individuality as part of a collective whole. I have witnessed and fostered incredibly inspirational stories of children overcoming obstacles as they learn to unicycle. Along their journey of self discovery they have grown physically, mentally, emotionally, and socially. They have become more resilient, confident, self aware, and capable learners. They have embraced challenges, achieved goals, and have inspired many through their journey. I am passionate about providing that same uniquely inclusive and empowering opportunity for children everywhere. Unicycle clubs simply make sense. They make sense for boys and girls of all ages, shapes, sizes, and colors. They make sense for parents, teachers, coaches, and administrators that promote lifestyles of health and wellness. They make sense for communities and cities across the nation that want to empower children to become more than they ever dreamed possible.They make sense for those concerned with the state of our educational system and for those alarmed of the bleak forecast of our nation’s health. But most importantly, the beauty of school unicycle clubs is that they inspire children to connect and communicate through the universal language of play. I find myself blessed and privileged to be able to share my vision and open people’s eyes to the limitless possibilities and profound impact of supporting school unicycle clubs. Creating this movement and sharing this one simple idea will improve and enrich the lives of children across the nation for generations to come. One Wheel. One World. One Love.